We're closing in on a milestone gang. 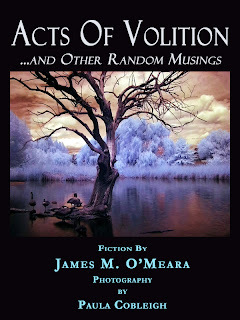 I'm reviewing the results of the Amazon free-download promotion for Acts of Volition and July 27. There were 119 downloads of Acts Of Volition in the United States, 10 in the United Kindgom. There were 103 downloads of July 27 in the U.S., 14 in the U.K., and 1 in Germany! Achtung! I've invaded the continent! That's not bad for a promo weekend. I did well enough to hit #61 on one Amazon list. Since the promo, the financial results are in to see how I did after the promo ended. 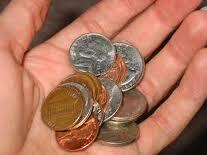 I've made $10.73, all but thirty-five cents coming from Acts of Volition. This moves me close to fulfilling a pledge I made when I ran for Plains Township Commissioner last year. I promised to double the money I made writing fiction in the ten years prior to the election. I'm $1.02 from matching the previous decade's total of $11.75. A buck and change from pulling even with a decade's work! Woo---freaking---HOOO!!! I can barely contain myself! Yes, it's breathtaking. I'll try my hardest not to get a swelled head. I figure I'll meet that campaign pledge by summer. That'll get me a couple dozen wings, or maybe a wing and pizza special at one of NEPA's fine eateries. In the meantime, back to writing ...no resting on my laurels. JoePa was a big influence on my life. It wasn't about the football. It was about the message: Strive for excellence. Do the little things right, because then the big things take care of themselves. Don't be afraid to reinvent yourself. There were other things, but you get the drift. These were messages about how to live life, not just how to approach football. Many of the high and low points of my adult life had a Penn State stamp on them. 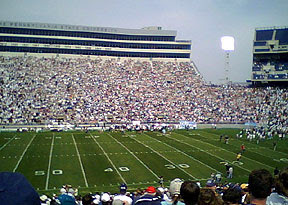 Through all the ups and downs there were the yearly trips to Beaver Stadium for Blue-White games and the occasional fall game (when I could get my hands on tickets). I saw the Lions beat (in chronological order) Rutgers, Maryland, Notre Dame, Michigan State, Indiana, Illinois, and Purdue from various seats in Happy Valley. I think I'm a good luck charm for the Lions; they've never lost with me in the stadium. Except for the Rutgers game (which I attended when I went to school there) all the other games were trips from northeastern Pennsylvania to State College. I've seen a bunch of them. My first was with my fiance, Cathy, and her parents in the spring of 1982. I remember we stopped on the way down to look at antiques (her father was big on antiques and flea markets). I kept trying to look patient while her father tediously inspected antique bottles as my watch ticked closer and closer to kickoff time. Cathy finally said, "Dad...THE GAME!" and we piled back into their car and resumed the drive to the stadium, arriving just in time. I only took one other trip to State College that year, when I saw the National Title-bound Lions beat Maryland 39-31. They won that national title on January 1, 1983. Not many weeks later, I lost Cathy to leukemia. There was a gap of several years before I started going to the Blue-White games again, but once I started going again I missed just one other game. Somewhere along the way, it became a tradition for my brother Bill and I. We both had young sons and we'd load them into the car early on Saturday morning and drive to State College. Over the years, while the game was the day's centerpiece, it was the time spent together that mattered most. Here's our usual routine: My brother and I argue politics all the way down. Our sons get a big kick out of hearing us jaw back and forth. They're grown now, and sometimes they throw their two cents in as well. We park in a garage downtown and go to lunch (usually 5 Guys). We walk the burgers off on the long uphill trudge to the stadium. We sit in stands, good weather or bad not caring whether we're dry, soaked, frozen or baked, and watch a game that means nothing with tens of thousands of other Nittany Nuts. After the game, we walk through town again a while then either pig out again or fill up on coffee and drive home. There are subtle variations year-to-year, but that's the most common script of daily activities. Then came the fall of 2011 and with it perhaps the worst scandal in college sports. Next was the firing, illness and death of Joe Paterno. Since the scandal broke, I often wondered whether or not we'd keep going to those spring games. I have a grandson now, and I'd looked forward to the day when he'd be making his first pilgrimage with us. But the scandal put the future of our tradition in jeopardy. I made my final decision soon after Paterno died. The alleged actions of Jerry Sandusky damaged heaven knows how many children. He's damaged the reputation of the University. He's tarnished or ruined the careers of people who in many cases had nothing to do with the scandal. They were simply collateral damage with the misfortune of being too close to the fire. My decision? Jerry doesn't get to pee in my cheerios. I won't give him that kind of power over my life. He isn't allowed to ruin this family tradition. I will continue to go to the Blue-White games, and the occasional fall game as well. It won't be the same. How could it, with Joe not there? But my brother and I will argue politics, eat too much food, drink too much coffee, and spend a few hours watching a game that is meaningless on a day that is always meaningful to us. It's here at last ...the debut of Acts of Volition, my second Kindle e-book. All I ask is that you read it then spread the word! Recommend it to others! "Lend" it via Amazon's lending program! And don't forget to review and rate it! First, because those of you who have been reading my work for all this time deserve some reward! And, in addition, I've learned first-hand the power of word-of-mouth. The promotion is for this Saturday & Sunday, January 21-22, 2012 and begins at 12AM Pacific time. And if you don't have a Kindle? Amazon has free software you can download to read Kindle books! If for any reason the links don't work, just go to Amazon and search for "James M. O'Meara" and you'll find my two books. I've just finished putting together my second Kindle e-book. The first go-round, I was just sticking a toe in the water and published an 8-page short story. 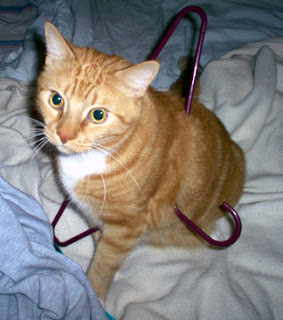 This time, it's three short stories and 2 sets of 2006 blog posts I've reworked. The whole e-book phenomena really empowers authors. At the same time, it's a lot of work you have to do instead of someone else at a publishing house. You've got to handle the layout, the artwork/photography, set the price, review royalty options ...there's a fair amount of non-creative work involved. But if you're a control freak (like me, for example) the whole shebang succeeds or fails through the efforts of the person in the mirror. In addition to trying like all get out to finish a novel, I'm rewriting a novella and several stories for a pair of Amazon Kindle releases. The theory is that I'm getting good enough that I can generate some real income with my brain and my keyboard. We'll see what kind of dose of reality I get when I finish the Kindle projects. "Catnip? No officer...I never touch the stuff. I swear. Yes, I'll come quietly."